The Leatherman Core weighs 10.8 ounces but that extra weight means more strength and a tool set to depend on. This 4.5-inch (closed length) tool was the first Leatherman multitool to offer professional-quality, hollow-ground screwdriver blades and includes three common sizes of flathead bits and one Phillips. The Core pliers are also the heaviest and strongest Leatherman makes, with jaws designed for needle-nose and standard plier applications as well as wire cutting and wire stripping. The all-stainless steel tool also has an option for wire crimping. The individual tool blades lock open for safe use. Although the Core contains both serrated and plain-edge knife blades, the companion C33LX Crater knife will definitely be easier to use. The Crater fits in the pocket with the handy stainless steel pocket clip, or attaches to a belt loop or other gear with the carabiner clip blade. The carabiner also opens bottle caps. The Crater's 420HC drop point knife blade features a thumb stud for one-handed opening and a combo-serrated edge for all sorts of handyman applications. This version of the Crater also allows opening through the Blade Launcher lever on the back of the knife. Just draw the lever back to open and lock the blade with no worries about hooking the knife's cutting edge with your thumb. The glass-filled nylon handle cuts weight to 2.38 ounces and provides a secure hold in all conditions. 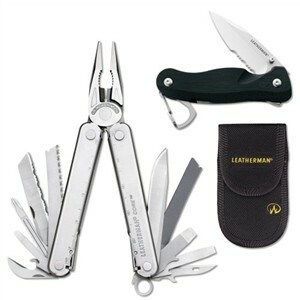 Leatherman backs up both of these tools with a generous 25-year warranty. See the Leatherman Fuse for a tough multi-tool without knife blades -- one you can carry anywhere.